It's a open secret that the little piles of green paste that come with your sushi lunch box are not true Japanese wasabi but ordinary grated horseradish with some green food colouring added to it. So you get all the heat of the condiment but none of the fresh herby tang of genuine wasabi (Wasabia japonica), also known as Japanese horseradish. 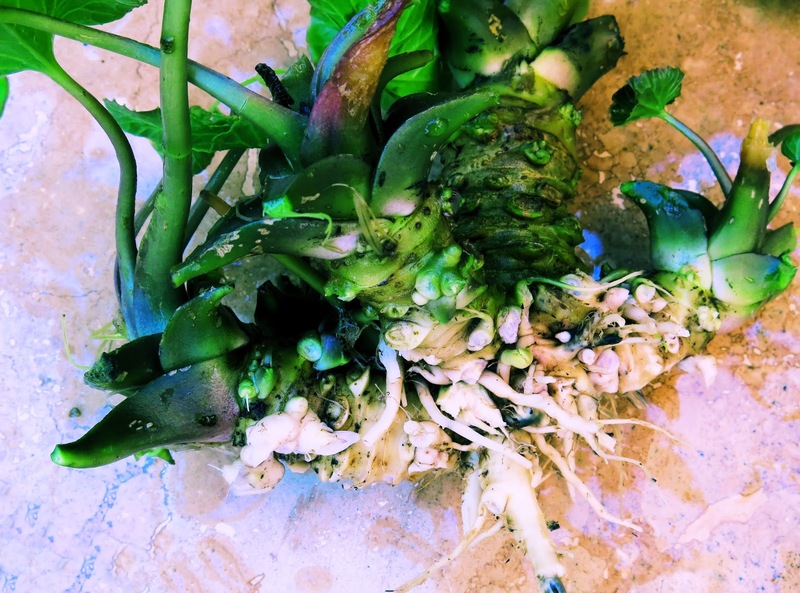 Like horseradish, wasabi is a member of the Brassica family, and it's the rhizomes, the swollen stems which are often thought of as roots, which are harvested and grated to make the classic Japanese wasabi condiment. Less well-known is the fact that the wasabi plant is in many ways well suited to growing in the UK. It's a reasonably hardy perennial, so it will survive a cold winter and its ideal habitat is cool, moist shade. In Japan, wasabi is a highly-prized and expensive crop - reputed to be difficult to grow. 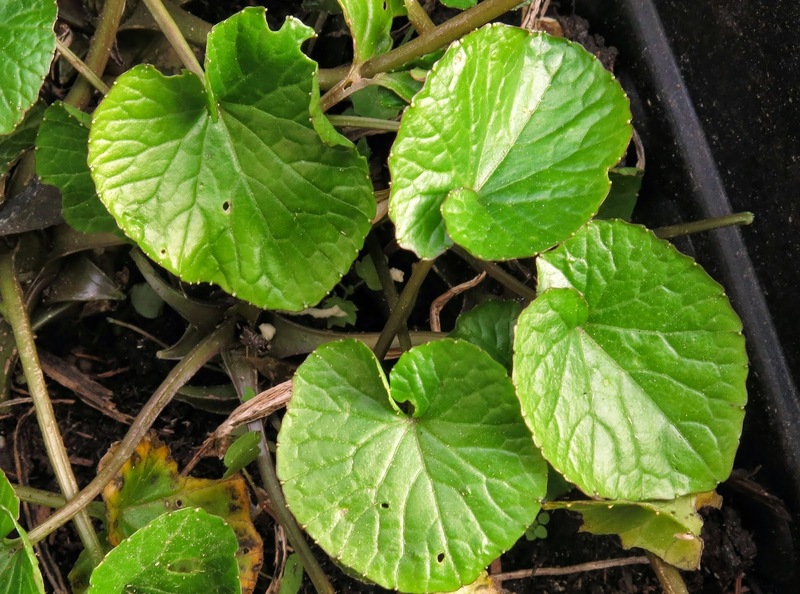 It's often grown hydroponically in moving water, much like watercress, and this sawa wasabi is considered superior to soil-grown plants. But if you don't have access to a sparkling fresh stream, the plant will be happy grown either in the open ground or a pot. What it doesn't like is strong sunshine and heat. I started off growing wasabi in a shady corner under a clematis. The plant survived quite happily but didn't develop much in the way of root - probably because although shaded, the location was too dry. I've since had much more success growing the plant in large pots, where I can choose the best position to grow them and also control the water supply. So you need a shady location - dappled shade is OK - and somewhere which will stay cool in summer, ideally, it should remain below 20 degrees Celsius. It also needs to be kept well-watered: if your shady borders also tend to be dry, consider growing in a pot instead. It's also worth trying out a drip method of watering - even if that's just a plastic bottle with a hole in it shoved into the soil - to ensure the soil stays moist. It takes two to three years for the thickened stem, or rhizome, to develop. You'll know when the rhizome is getting ready to harvest, as the swollen stem will be visible just above ground level, ready for you to lift. when the wasabi is mature. In the meantime, while you're waiting, the leaves, stems and flowers are all edible. The round succulent leaves will give your salads a crunchy kick, and the delicate white flowers which appear in spring have an elusive peppery flavour. You will find the leaves and stems are also extremely popular with slugs and snails. It's another reason why wasabi grows better for me in a pot: I can keep them under maximum security conditions, surrounded by copper, ground-up eggshells and with the pots kept well away from encroaching foliage. Even so, I find I have to do the rounds and inspect under leaves very regularly to catch them before they decimate the crop. The wasabi will be ready to harvest at the end of the second year when the thickened portion of the stem is about an inch in diameter. There is no harm at all in leaving it in the ground for longer. Dig up the plant and wash well in lots of cold water, trimming off any fine roots and the remaining leaves. Cleaned, but not yet trimmed: freshly-dug wasabi. 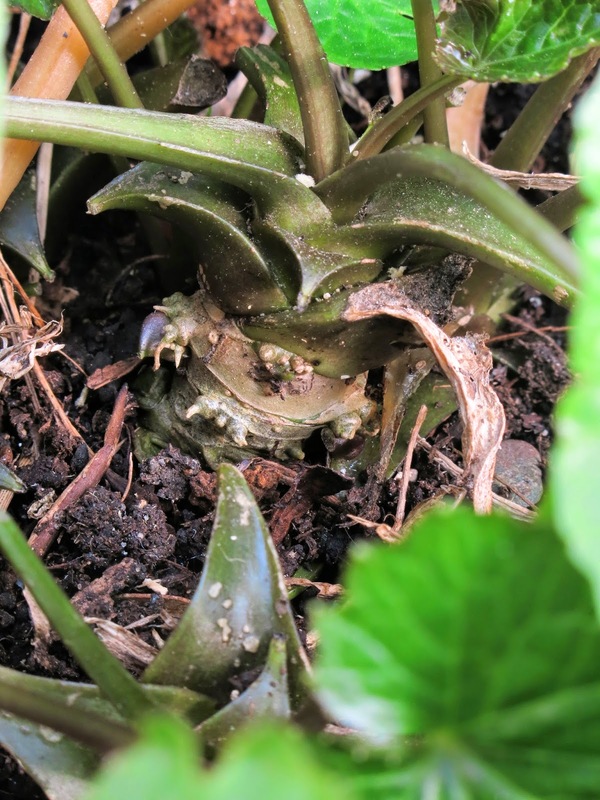 You will be left with a knobbly green rhizome, pitted with leaf scars. This will keep in the bottom of the fridge, preferably wrapped loosely in a clean damp cloth, for a few days. 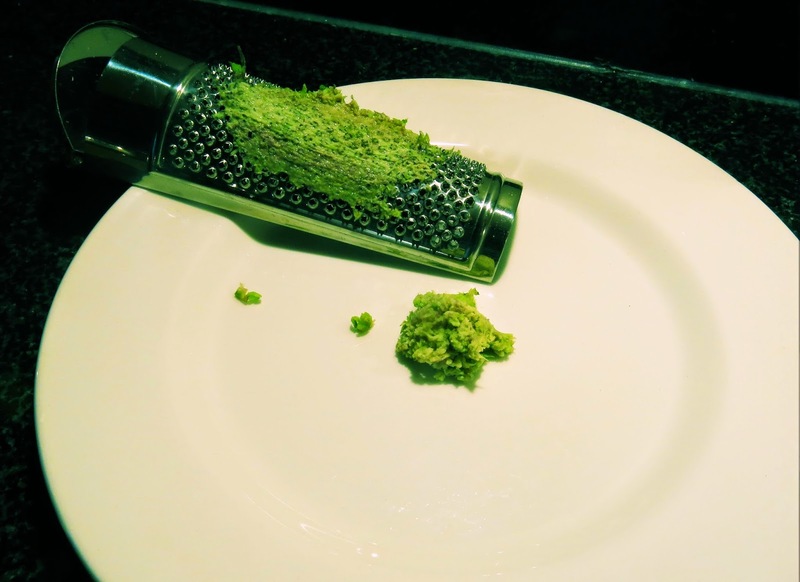 Scrub the root well and then grate, on a microplane or zester to get your fresh wasabi paste. After some experimentation, I found the nutmeg grater gave me the best results. The paste should be moist and squidgy and free from fibres - it should hold its shape if you press it. Leave it to 'rest' for about 10-15 minutes then eat as soon as possible as it will start to lose flavour if it is left standing for too long. The easiest way to propagate your wasabi plants is by separating the small plantlets which form at the base of the main stem and planting these up. Late summer is a good time to do this so that the new plants have a chance to establish themselves before winter sets in, although they may well have to be nurtured in a small pot at first before planting out. I've bought wasabi plants from the Scottish nursery Poyntzfield Herbs and also once from my local garden centre when they had a batch in. Plants are also available from Suttons as part of its James Wong Homegrown Revolution range and from The Wasabi Company, which also sells fresh trimmed rhizomes. 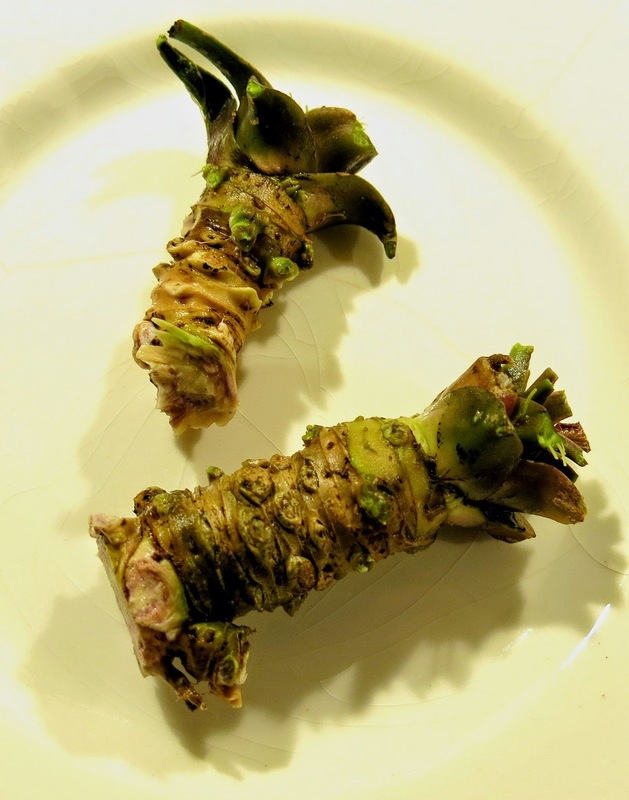 The history of wasabi and its place in Japanese culture: http://www.sbfoods-worldwide.com/foodCulture/wasabi/secret.html. The health benefits of wasabi included in a general article on Steamy Kitchen: http://www.steamykitchen.com/15015-real-fresh-wasabi.html. You can rely on sunflowers to cheer up the allotment at this time of year. 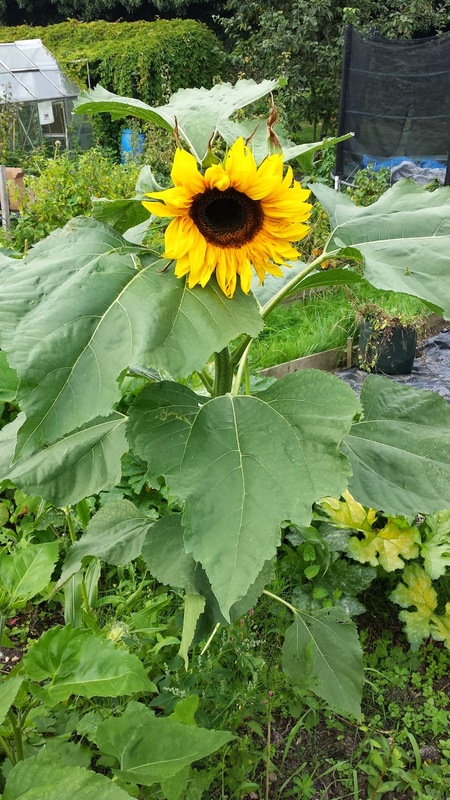 This one, the aptly named Giant Single sunflower, was grown from some very out-of-date seed which I sowed back in April on the basis that I might as well use them up as buy fresh. I think the packet recommended sowing by end 2009. Expiry dates on seed packets can often be used as guidelines rather than hard and fast rules. I have successfully germinated out-of-date lettuce, tomato, chilli, and beetroot seeds. Anything from the season after the expiry date, to several years in the case of lettuce in particular. Of course germination rates are nearly always better with fresh seed and a lot depends on who the seed has been stored in the meantime. If seeds are kept cool, even cold, in the dark and, most importantly, dry, they can stay viable for years. I've always been told that parsnips and carrots should be sowed when very fresh and always buy these new each year. Parsley, another member of the umbellifer family, doesn't germinate well if not sown within a year, but with most other veg, it can't hurt to sow any leftover seeds in modules or the open ground and see what comes up. 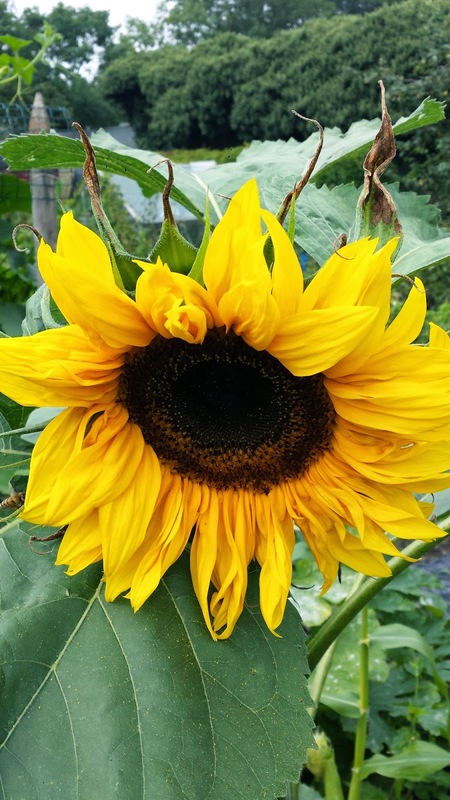 In the case of these best-by-2009 sunflowers, around 50% germinated and there are another two Italian White sunflower plants about to burst into flower as well.